Keep lives safer by fortifying entry points with affordable security glass! ​In the event of an attack by a malicious person on a facility or its occupants, School Guard Glass keeps the criminal from easily breaking the glass to enter locked down or adjacent areas. The glass is an attack rated security glass and can withstand repeated shots, and then blows from a hammer or similar objects, and still keep the perpetrator out, preserving precious minutes needed for law enforcement or help to arrive. 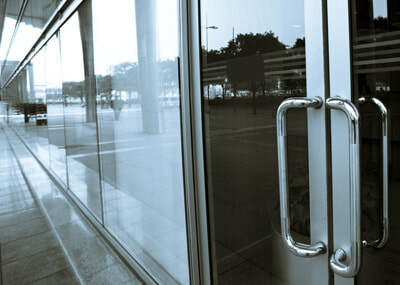 When used in classroom doors, the security glass creates a "safe room" for the class during a lock down removing the easy to breach failure of typical door glass. It's a proprietary patented fusion core cladded with glass to provide optically clear vision and durability against forced entry ​after being shot! Virtually any glass window or door application can be replaced, or designed with SGG! Is it out there now? Are others using or designing with it? YES! School Guard Glass was developed in 2013 and has since been installed in thousands of facilities across the country with more locations added daily. Due to confidentiality, we are not at liberty to discuss where exactly the product is installed. Contact a representative below for more information. PLEASE NOTE THAT NOT ALL SPECS ARE SHOWN. NEW CONFIGURATION ARE ADDED FREQUENTLY. PLEASE CONTACT US FOR ANY CONFIGURATIONS YOU DESIRE THAT ARE NOT LISTED HERE. Are there feature options available? Those are just a few of the options available. Contact a representative for even more possibilities or custom design makeups.